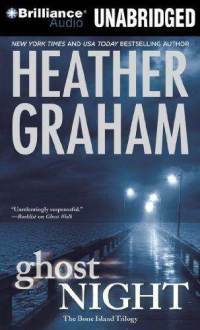 Title/Author: Ghost Night (Bone Island Trilogy #2) by Heather Graham. Synopsis: A slasher movie turns real when two young actors are brutally murdered on a remote island film set. Their severed heads and arms are posed in macabre homage to a nineteenth-century pirate massacre. Two years later, Vanessa Loren is drawn back to South Bimini by a documentary being made about the storied region. Filmmaker Sean O’Hara aches to see how the unsolved crime haunts her…and Sean knows more than a little about ghosts. My Thoughts: I didn't love this book and I didn't hate it. I thought it was entertaining as I drove around in my car and listened to it. There are certain people I know who would like it and others who I know wouldn't. What I like about this book is that there is a good amount of detail regarding the ocean and diving. It’s pretty interesting. I also really liked the setting of Key West Florida and the Bahamas. I have never been to the Keys, but I felt like I was there because of the way the climate, the neighborhood, and the people are described. What I also really enjoyed was the pirate legend of Mad Miller, Dona Isabella and Kitty Cutlas. I think their legend and even their names are cool. However, the detail of the ocean, salvaging and diving is so abundant that it sometimes bogs down the story. I appreciate the amount of research the author did but it treads into the "telling" territory. I also felt that most of the book was the preparation of the film crew to actually go out on the boat and re-visit the island that the murders took place on. I know that in real life there is a lot of prep before a shoot, but it almost felt like false starts. Just when I thought something was going to happen there was research and background checks. I'm wondering if this book could have been edited down a lot. The two leads, Vanessa and Sean, were honest, mature and likeable. That being said, some people may complain that they have no flaws and are “too” good. This didn’t bother me one way or the other. I felt kind of neutral. To me, they are there to serve the story. One thing I do like about the characters is their romantic relationship. Although when they first met there was a misunderstanding, they were both mature and honest, like the characters themselves. They didn’t play games or act coy or talk about being hurt before. They were like, “Hey I’m attracted to you, let’s get together and see where this goes.” It was kind of refreshing and surprising. The narrator did an excellent job. I actually recognized her voice from the audio book of Wild Ride. She has a real gift for doing a lot of different voices that are distinguishable from each other. Although I don’t think I’ll be going back to read the first book or will continue with this trilogy, I enjoyed visiting Key West with the author and learning about diving. If you are interested in a light read thriller with a dash of paranormal and some romance you may like Ghost Night. Well it seemed really promising from the little blurb about it, but I could see myself not getting into it because of the over explaining and everything. But I'd probably still check this book out because I'm always in the mood for a thriller! I loved this series..simply because of Bartholomew. I've become so insanely addicted to audiobooks, but I have yet to try a thriller type. I'll have to pick one up, though, perhaps not this one. But I do have to admit that I like the sound of that romance. Why play games when you could just go with it?